What Is the Capital of Norfolk Island? The capital of Norfolk Island is Kingston. Heritage buildings on Norfolk Island. The capital of the Norfolk islands is Kingston. Where are the Norfolk Islands? Norfolk Island is one of the three islands that form Australia’s external territories. Other territories are the Northern Territory and the Keeling Islands (Christmas Island and Cocos Islands). Norfolk is a small island occupying an area of only 34.6 square kilometers. It is found in the South Pacific Ocean between Australia, New Caledonia, and New Zealand. The Island is defined by pine trees and jagged cliffs. The Norfolk Island pine is a symbol of the island hence it is pictured on the island’s flag. 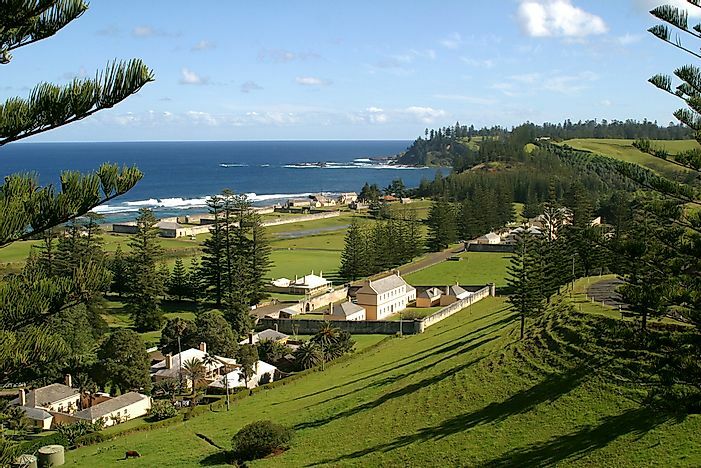 The inhabitants of Norfolk Island are known as Norfolk Islanders. The official languages spoken in Norfolk Island are English and Norfuk. English is the most spoken with 67% of the Islanders able to speak it. Norfuk is a dialect mixed of the 18th century English and ancient Tahitian. The currency used in Norfolk Island is the Australian dollar. The Administrator of Norfolk Island territory is Eric Hutchinson. How Was Norfolk Island Formed? Norfolk Island was formed as a result of lava ejection by an undersea volcano. Mt. Bates is the highest point on the island standing at over 1000 feet above sea level. It is reported that Mt. Bates is much higher than this as its bulk is submerged under the South Pacific waters. The capital of Norfolk Island is Kingston while Burnt Pine is the largest town. Other towns in the Island include Bumboras, Middlegate, Rocky Point, Cascade, and Anson Bay. Burnt Pine is the official commercial hub of the island while Kingston is the administrative town. The vice regal, judicial and administrative offices are located in Kingston. When its territories are considered, Kingston is the second oldest town in Australia. Kingston was founded by Lt. Philip Gidley King and other settlers who arrived in the city in 1788. These settlers built most of the spectacular buildings that remain outstanding today. The Kingston and Arthurs Vale Historic Area is a beautiful historic town site. It stretches to the island’s southern coast, bordering the calm waters of Emily Bay. The Arthur’s Vale Area was recognized by UNESCO as an iconic historical site. Kingston adopted the Roman-style grid plan in the 1830s. Before then, Kingston had several winding irregular lanes. The town comprises of only two long roads, Bay Street, and Quality Row. These two roads are then connected by three short streets, the Bounty Street, Pier Street, and Bligh Street. These three streets are carried across the Watermill Creek by small stone bridges. The city is filled with colonial architectural buildings that date from the 1790s to 1850s. Such include the Royal Engineer’s Office, Piper’s Boat Shed, the Marine Barracks, and the Old Military Barracks. The Governor’s Mansion is on the Dove Plot Hill. It was constructed in 1792 and is the oldest vice-regal site in Australia. All other buildings are located in the old town or along Quality Row. Protestantism is the predominant religion practiced in Kingston with 46% identifying with it. The Roman Catholic religion is the second after Protestantism. The main tourist attraction places in Kingston are the Norfolk National Park, Anson Bay, and Fletcher’s Mutiny Cyclorama. Others include St Barnabas Church and Emily Bay.